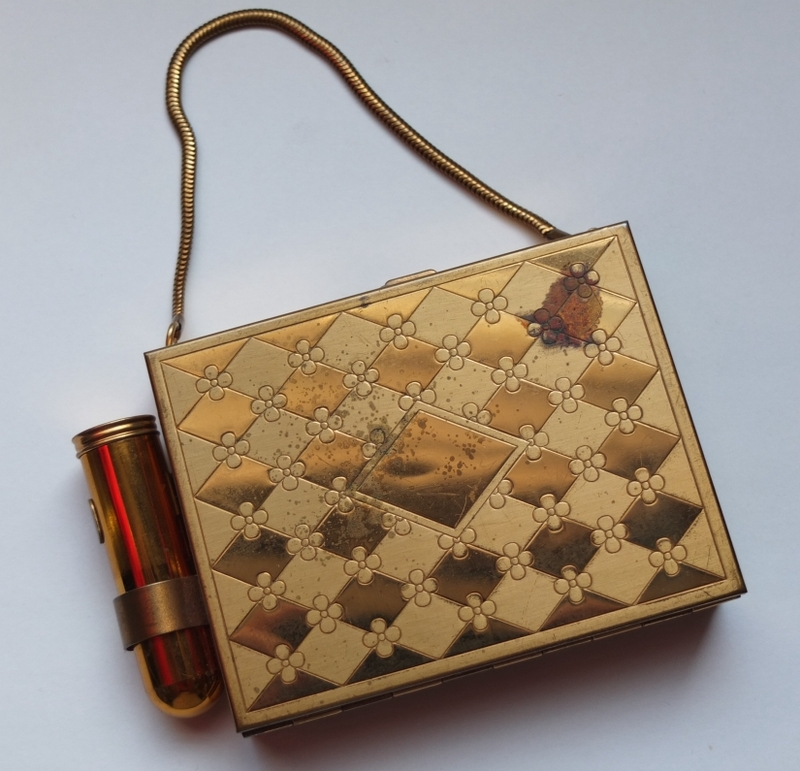 Oh, for the Love of…Vintage Compacts! | Oh, for the Love of Vintage! Sorry I haven’t posted in a while. The computer is still broken so I’m posting this from a laptop. I wanted to add a new post because I really enjoy blogging and also because I don’t want this blog to die an early death or become irrelevant. Everything changes so quickly on the Internet with blogs, websites, forums, etc. being replaced or getting lost down the ‘memory hole.’ Not having Internet access has shown me that when it comes to online activities (blogs, email, Twitter, etc. ), the truth is ‘out of sight, out of mind.’ So, dear readers and friends – here I am, please don’t forget me! This post was inspired by a fellow vintage blogger, Powder Keg Compacts. Jenn often features vintage compacts on her blog and offers some lovely ones for sale on her website. Be sure to check these sites out as Jenn is very knowledgeable about vintage compacts! I’ve been collecting vintage compacts for several years now. I like having a variety of them to use with my different vintage outfits and handbags. 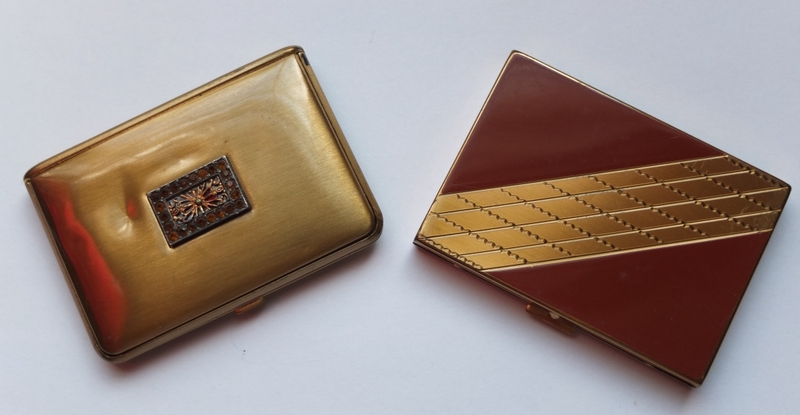 I particularly love Art Deco compacts and compacts from the 1940s and 50s in a variety of shapes, sizes, colours and materials. As you know, I love novelty items and that is also true with compacts. What I mean by that is compacts that are in irregular shapes such as human hands, telephones, flying saucers, suitcases, watches, pianos, chairs and other furniture. 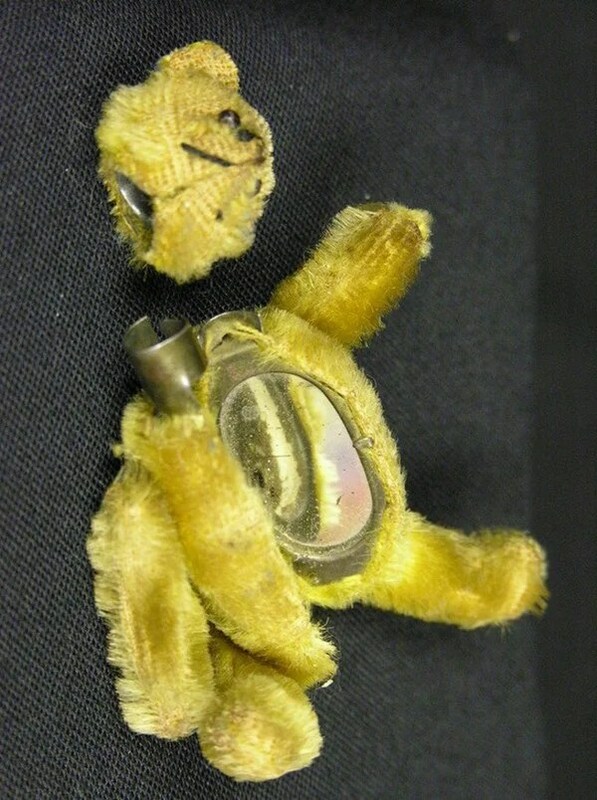 Also, I love vintage compacts that are hidden in another item, such as in a bracelet or even in a stuffed teddy bear! For a more complete list of designers, visit History and Designers Behind Vintage Ladies Compacts. I have yet to add a scarce Schuco teddy bear or stuffed monkey compact to my collection, but I’m on the lookout! Instead, my collection consists of day and evening compacts in a variety of styles from several different companies. Sometimes I like to use one compact for daytime and one for night, to match my outfit and handbag. I use my vintage compacts for the mirror inside and haven’t replaced any of the vintage powder with new powder. Apparently, it is a ‘no-no’ to keep the vintage powder and rouge in the compact as it can harm the metal and paint. Perhaps when I get a chance, I’ll remove all of the powder and rouge from my compacts. Better safe than sorry! 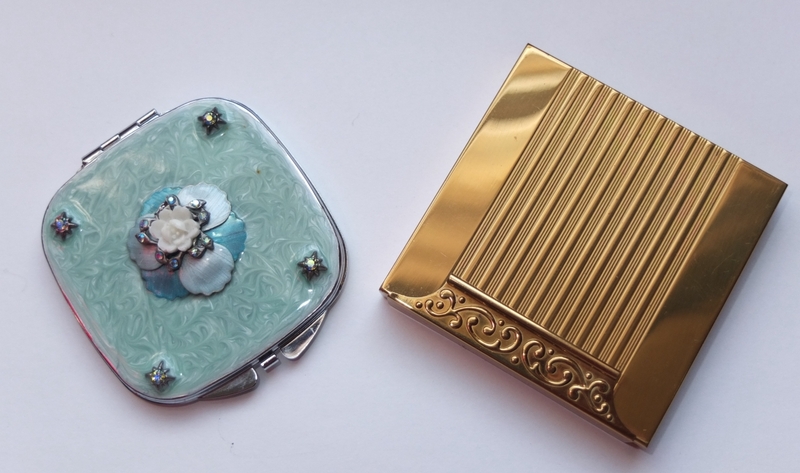 For more on compact care visit How to Collect Vintage Compacts. Now, a closer look at my compacts! 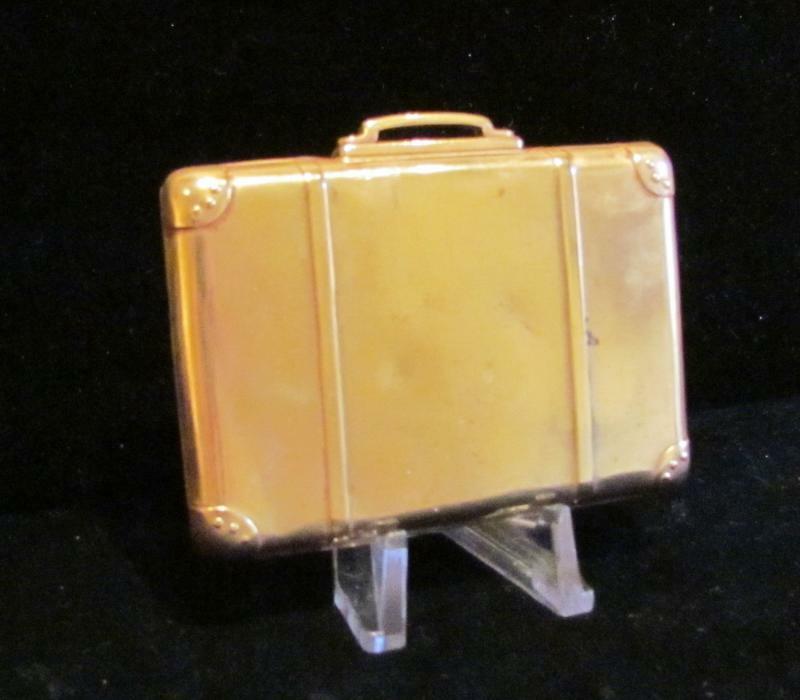 1950s enamel and rhinestone mirror compact; 1950s gold Avon powder compact. 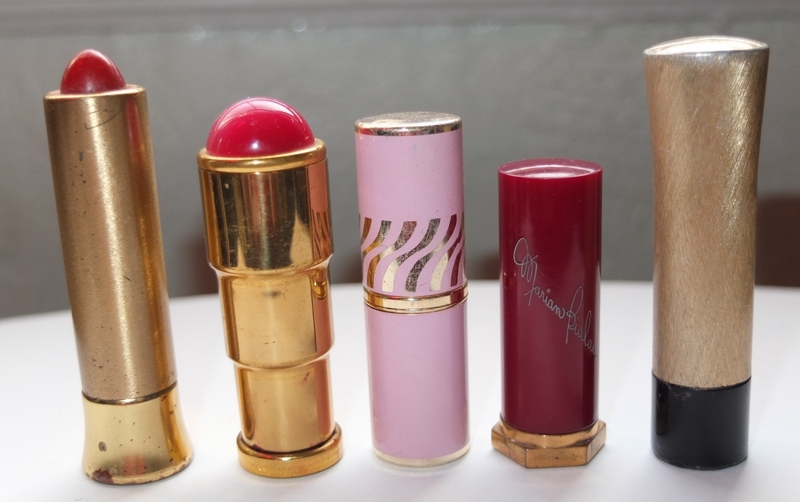 These are 1950s powder and rouge compacts with the original makeup and sponges still inside. The compact on the left is by Mondaine and the right is by Shields. 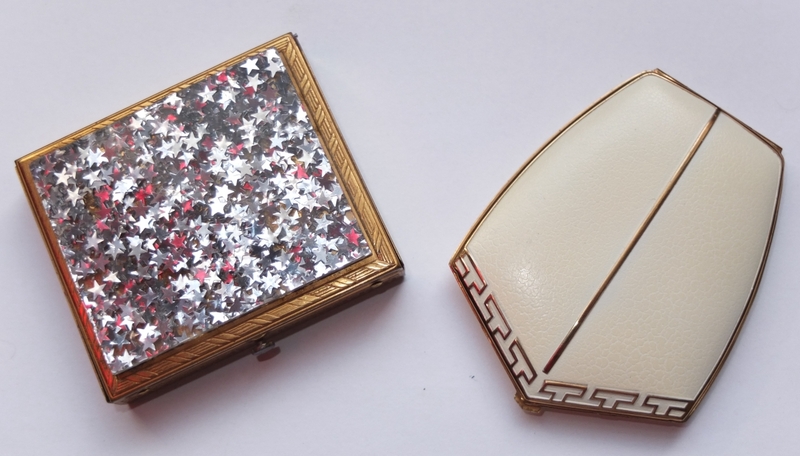 1950s lucite silver star confetti compact by Dorset; 1950s cream and gold compact by Elgin American. This is one of my favourite compacts. 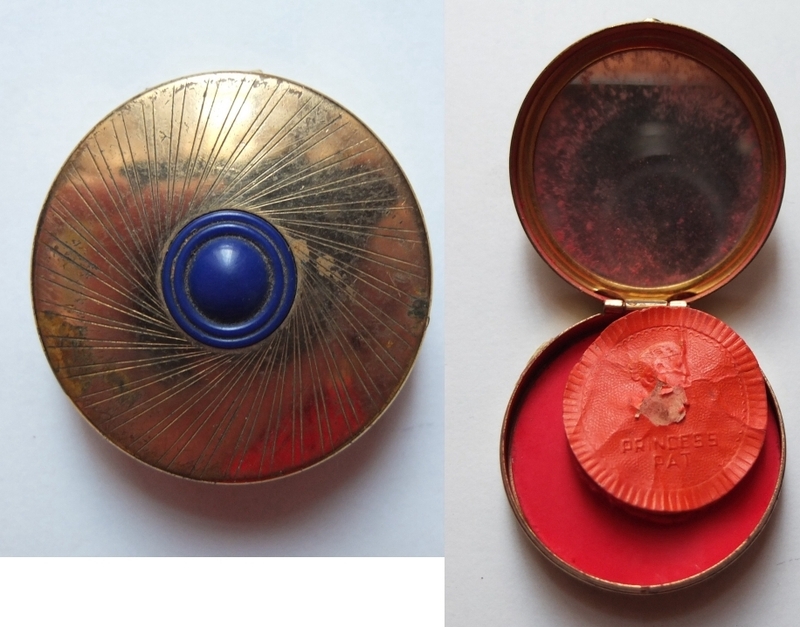 It’s a Stratton Piccadilly loose powder compact from the 1950s. A few years ago, I had my photo taken at this very spot in London. I’ll have to add the photo to this post once my computer is fixed. This compact is near mint inside and I don’t believe it was ever used. I’d like to add some powder to it myself. I wonder if any companies make pressed powder inserts that would fit a Stratton vintage compact? If you have any idea, be sure to let me know! This is my other favourite compact. 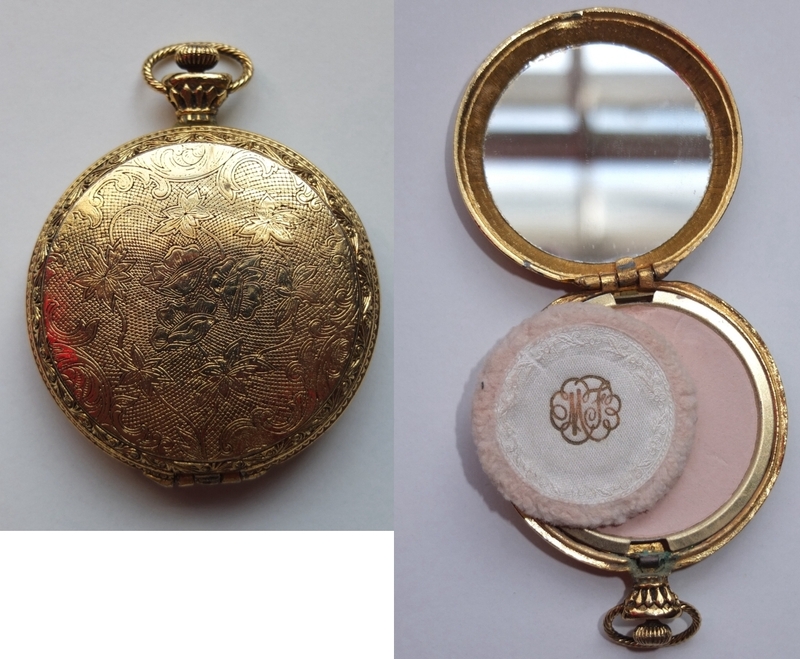 A 1950s Max Factor watch pressed powder compact. So sweet and unique! This is my 1950s minaudiere, also known as a carry-all. It includes a place for powder, lipstick, cigarettes and other items. Sadly mine has a rust strain on the top. Any ideas on how to get rid of that? Do you collect vintage compacts? What are your favourite kinds or companies? Hope to be back posting regularly soon! What a marvelous collection, you have, I’m thoroughly inspired and impressed! I don’t have any vintage compacts yet myself, but would love to add one or two (at the least) to my vintage accessory collection in the future. PS happy hunting for vintage compacts! Mine are all from yard sales, flea markets and the occasional thrift store. Beautiful! I’ve come across some Dorset compacts myself (and some other ones that I can’t think of right now, but believe it’s a woman’s name starting with ‘s’). Nothing as interesting as that teddy bear one, but cute nonetheless! I’ve heard ketchup works on the green tarnish you often find on vintage items, but I don’t know if it’d work on rust too. Naturally, I love this post. And not surprisingly, you and I have a few of the same compacts–the Mondaine and the little Tangee rouge compact. I LOVE the star confetti one! I collect and find that Max Factor Creme Puff fits in most of them. I too collect powder compacts and I found this though Jem [powderkeycompacts]. I love the cream and gold Elgin [the greek key one] I have it but just in the gold colour! I often blog about my compacts if you want to take a peek over on my blog! I left a comment on your blog, but I’m not sure if when through!? itsallourvault, I will try the ketchup – why not! Louise, thank you for letting me know. I will try that! Rachael, you have the same compact in gold? I bet it’s really lovely in a solid colour. I’m off to check out your blog now, thanks for stopping by! Can anyone help me? I have a Kigu Flying Saucer Musical Compact that I was hoping to sell, do you know of anyone who would be interested in buying this? I would love to see your minaudiere! What a charming collection. I love collections. Pingback: What’s in Your Vintage Summer Handbag? « Oh, for the Love of Vintage! Hello. I have a Stratton Compact, Josiah Wedgwood pattern that I am looking to sell. Not sure how old it is and I have all original components. The powder puff has disintegrated. Hi. Just tried emailing you and it came back unsuccessful. Do you have another email I can use? Thanks. Hello that is my email address linda@lindabasham.wanadoo.co.uk I have been receiving emails successfully this morning so I cannot think what the problem is? If you like you can give me yours and I shall email you .Kindest regards Linda. Hi Linda. I re-sent email. It looks like it went thru this time. I happen to come across your blog here just randomly searching for info on a few of my compacts in my collection. And I felt compelled to share some of my jewels with you or any of your followers. Maybe you could do a blog on its own, with some pictures and info I could provide. Cause believe you and me I have ALOT of very nice, and hard to find gems. (including the compact teddy bear) you mentioned in this blog. And even a tiny perfume monkey. And I feel alot of other compact collectors would enjoy to see or hear about them, as I always do with others’ collections. I not only collect compacts, but other novelty womens items from 1900 to 1950. As well as purses, mostly metal mesh (mandalian, whiting and davis) ones. And fine beaded belt looped purses. I like most collectors buy whatever catches my eye. Its a curse lol. And on top of everything I enjoy restoring, I have several pictures I could include of before and after projects I’ve done. Mainly on my purses, and only the ones I’ve purchased that needed it. I like to keep my compacts in there original condition, many of them even bieng old store stock complete with the boxes and everything. And as anyone would understand, the collection just keeps getting bigger. So I know you enjoy blogging and thought I would see if you would be interested in doing a ‘story’ on my items. Definitely shoot me an email and we can speak about it. my e-mail is Jodywaszkiewicz@gmail.com I look forward to hearing from you. 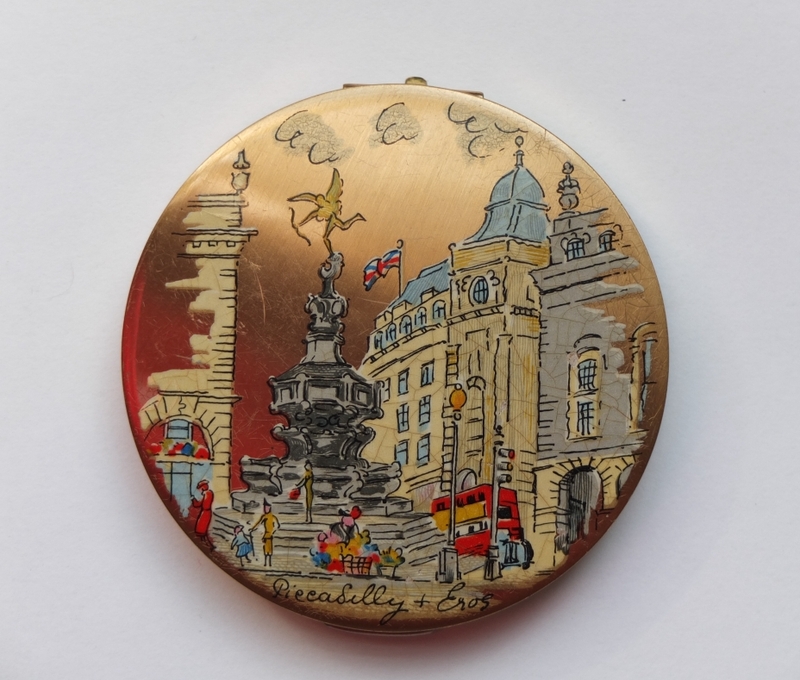 i have a stratton compact that is square,cushion shaped,cream enamel with a hms hermes icon in the centre,how can the vintage/value of this be established,the underside and sides are brass in colour,maybe a souvenier? 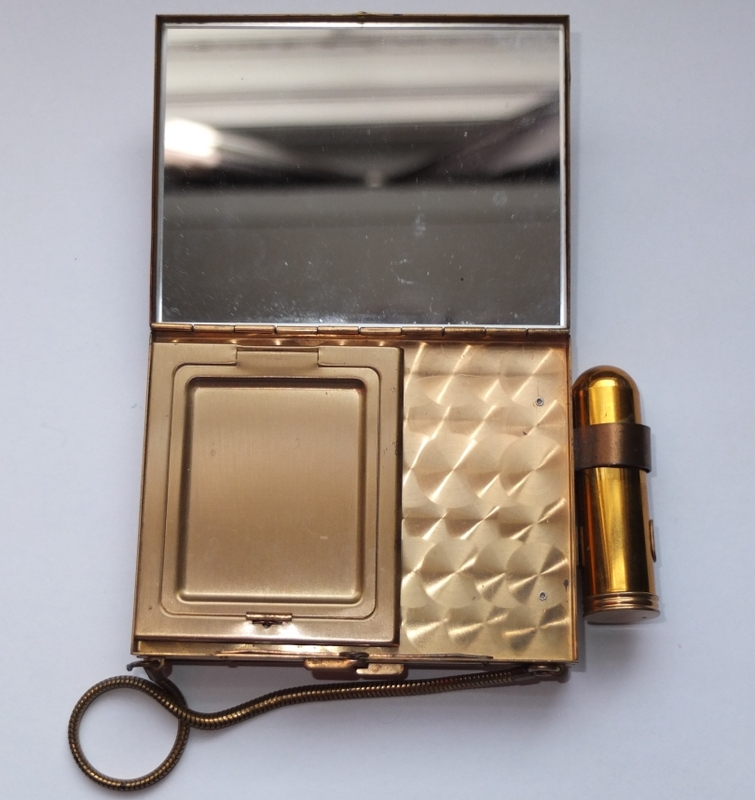 I have a vintage Avon compact that I would like to send you a picture of to see if you can tell me anything about it. Would you be willing to do that for me? If you are computer literate just Google ‘vintage Avon compacts’ and then request IMAGES up top. When a picture comes up like your compact, click on the very top link that says something like: Avon vintage compact…etsy. You can view each one’s price, details, and see pictures. Good luck! Thanks very interesting, finding info very hard especially dating a unit,i have a collection of around 350 and constantly growing, my favourites are the kigu cherie always on the look out, also now turning my attention to early american units. « Oh, It’s a Sailor’s Life for Me!